A Corporate Film is an incredibly powerful tool that enables you to communicate your business and ideas to your customers or employees. Therefore it is very critical to produce a video that reflects your values and purpose clearly without the traditional monologues and charts. 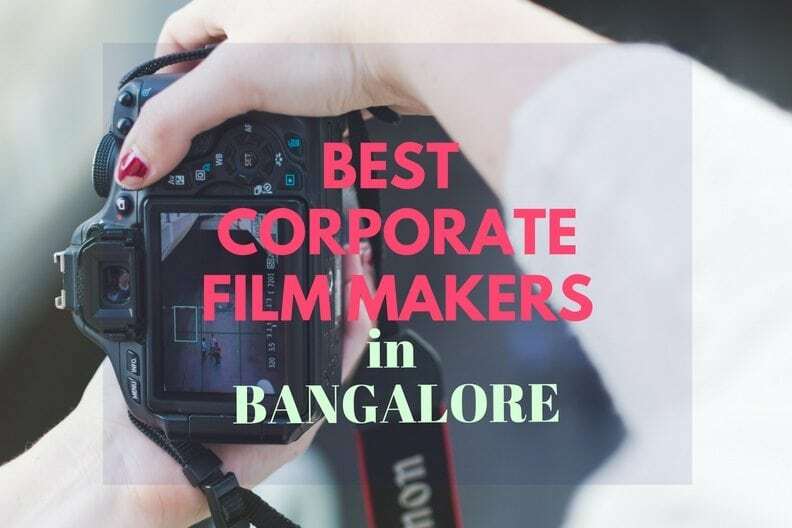 To help you find the right Corporate Video Production Company, we did some research and spoke to the best corporate film makers in Bangalore. With a beautiful and well organized website, VHTnow believe in creating films that invoke an action. Their motto is once they start a project, they work their socks off till it is the best it can be. A film-production house that prides itself in blending social research, marketing sensibility and creativity, delivering touching films that meet communication goals. A full service, one-stop video production company specializing in photography, film and design. They offer end to end media production services including line production all over India. Their way of Storytelling creates a metaphorical expression of realness. They live on Designs, Love doing Digital Media Marketing, Breathe brands and are crazy about Films. “Having a team from an MBA background, we believe in delivering a Business Solution rather than just a Film. Having done over more than 100 Films we work on increasing Quality while reducing the Client’s effort, time and cost. CurleyStreet Media was founded with the intrinsic belief that films made with love can change our world for the better. They match their skills to your requirements and deliver ideas and concepts that amalgamate your identity and their aesthetics. “We have carved a distinct identity as a pioneer in creating aesthetically immaculate films that deal with real issues. We believe that our keen, almost neurotic attention to detail and commitment to originality, shapes us into a unique team. Their roots are in film production with years of experience in the field. They can provide end-to-end & specific production services with specialization in Online Edit, Offline Edit, On-set Post, DI, Sound Design and Title Graphics. Started in 2010, this company strive to understand our customers and work towards accomplishing their dreams. Their team of professionals will assess your needs and fashion the most appropriate mode of your bringing your dreams to life. “We value time, commitment & hardship. We try to exceed our own limit & bring out the best within ourselves, for us it’s creativity or nothing !! A bunch of like-minded souls who speak, dream and live through visuals. Each new venture is added as a page in a book. A book so thoughtfully put together. So when they flip through it, they leave behind an awe-inspiring visual legacy. Top Clients: Wipro, Lenovo, Biocon, Dell, Jindal Steel Plant, Airtel, Toyota, Touchtel Broadband, HP, IBM, ITC Infotech, Epson. With 8 years of enriching experience in video production services, Cinimage is a contemporary creative Film Production Studio that creates personalized experiences across the realms of video production and animation. Having an energetic bunch of people with the desire to make great films they love what they do and their works speak their passion. Top Clients: 3M, LinkedIn, BOSCH, Infosys, Hidesign, Wrangler, Practo. Want to know more about video editing tools? Read our blog on How WordPress can be a great platform for video bloggers and some Great Video Editing Tools. Take a look at our blog post on The Best PR Agencies in Bangalore to Work With too!